Pools playground, Victoria Park. Photo: courtesy Studio Ludo. A few years ago, my family was asked to relocate to London for six months for my husband’s job. It was a once-in-a-lifetime opportunity, but it also meant leaving behind my full-time position to care for my one-year-old. 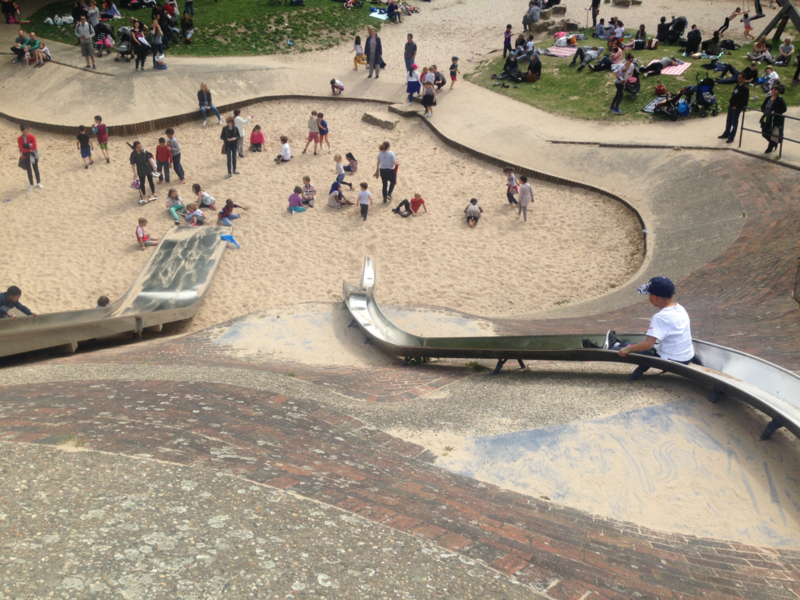 Luckily, previous incarnations of my career involved both designing and researching playgrounds, and I decided to use those six months to study playgrounds in London, while also spending time playing in them with my daughter. And so, the London Study of Playgrounds and my non-profit Studio Ludo, whose mission is building better play through research, design and advocacy, were born. For the first two months, my ‘research assistant’ and I visited 45 playgrounds across London, of all shapes, sizes and locations. I ultimately picked 16 to study, focusing on the ones that had unique designs, open-ended play structures, a variety of surfaces, and play ‘affordances’ (i.e. boulders, logs, and plants installed specifically for play). I then spent four months studying play behaviours in these spaces, ultimately collecting information on over 18,000 people, which included age, gender, ethnicity, physical activity levels, play movement types, and location. Marylebone Green Playground, Regent’s Park. Photo: courtesy Studio Ludo. After returning to the US, I partnered with the RAND Corporation and compared my findings with their National Study of Neighborhood Parks, which focused on parks and playgrounds in cities across the US. I used the data from San Francisco, Los Angeles and New York, as those cities had population densities that most closely matched London. By looking at playgrounds of similar size and population density, I discovered that the London playgrounds had 55% more visitors, 14% more adults, and children and teens were 16-18% more physically active than the comparable playgrounds in the US. Not only were the London playgrounds more popular and more active than the US ones, but there were very specific things that were attracting people. 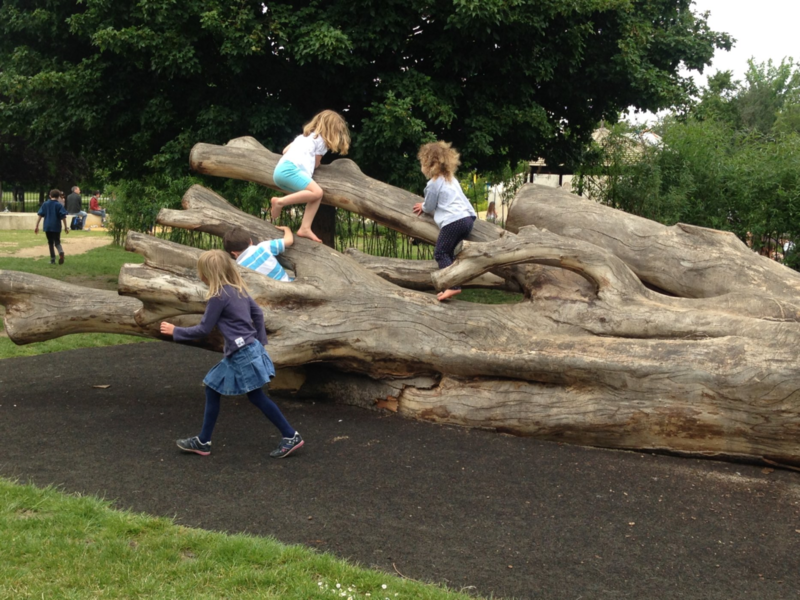 Half of the children in the London playgrounds were in just four areas: climbing structures, sand, grass, and swings. These same four areas also promoted the most physical activity. Teens loved risky elements, such as towering treehouses or high-speed spinners, while adults were located predominately in grassy areas or benches, and were most active while pushing children on swings. One of the most interesting findings was that there were an almost equal number of children (48%) and adults (47%) in the London playgrounds. It is clear that these spaces, traditionally thought of as serving only children, are actually a rich community resource. Most blurred the boundary between play space and park, and felt welcoming to all ages. They had plenty of places to sit, grass areas for picnics, restrooms, and nearby cafés for coffee and snacks – all great support structures for adults. 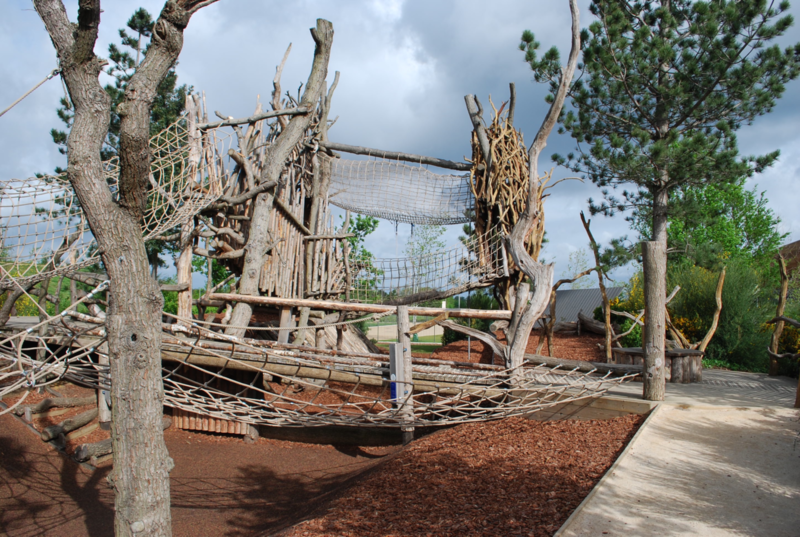 The play areas themselves had massive pirate ships, huge concrete mountains with multiple slides, large swathes of sand, and wild planted edges for children to go on adventures. By contrast, the US playgrounds in the study had few options for adults to sit, little to no plants or trees, and were closed off from adjacent grass areas. The play designs were fairly homogenous, following a typical formula of post and platform structure, rubber-surfaced floor, and surrounding fence. Tumbling Bay Playground, Queen Elizabeth Olympic Park. Photo: courtesy Studio Ludo. Both passive and active spaces are important. Blur the lines between play and park. And don’t forget cafes and bathrooms! Provide ‘play affordances’, such as boulders, logs, plants and topography for inexpensive but effective fun. All playgrounds should have the top five: grass, sand, climbing, swinging and sliding. Water and loose parts are another plus. Everything on a playground should be playable, including surfaces. Fun should be prioritised over safety and maintenance. The best playgrounds look dangerous but are completely safe, offering ways to play based on skill level, strength and bravery. While these lessons relate specifically to playgrounds, they can be applied across the entire urban design spectrum. Focusing on the creation of spaces that work for our littlest residents actually makes whole cities more livable for all. Meghan is the founder and director of Studio Ludo, a non-profit dedicated to building better play through research, design, and advocacy. She has degrees in architecture and landscape architecture, over fifteen years of experience in the design field, and is a certified playground safety inspector. 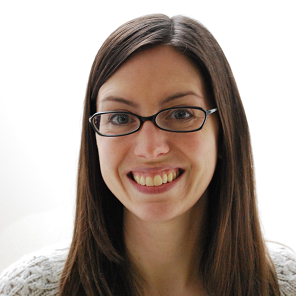 Her research focuses on how the design of play environments impacts physical health and social behavior, and she has presented at conferences for Child in the City, the International Play Association, The Association for the Study of Play, the US Play Coalition, and the American Society of Landscape Architects Online Learning Series.